The bill to cover more than 60,000 uninsured Mainers faces a certain veto from the governor. 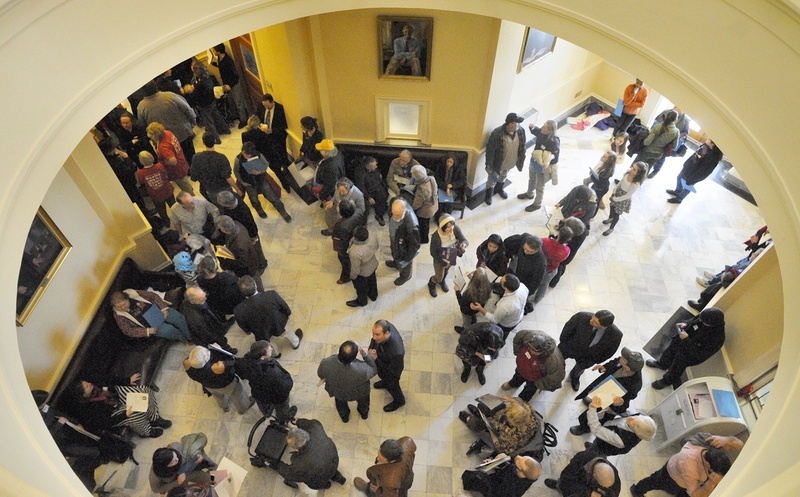 AUGUSTA – The state Senate gave final approval Friday to a bill that would expand the state’s Medicaid health care program to more than 60,000 uninsured Mainers and establish a managed care system for the 320,000 current beneficiaries. The proposal faces a certain veto by Gov. Paul LePage. The Senate enacted the bill without debate or a roll call vote, sending the compromise measure co-sponsored by two moderate Republicans to the governor. The bill was designed to attract support from conservatives, but a majority of Republicans in the House and Senate backed the governor’s staunch opposition. A veto of the bill will face override votes by the Legislature, but will likely be upheld. An override requires votes from two-thirds of the lawmakers present and voting in each chamber. The bill, while passing, failed to win two-thirds support in roll call votes in the House and Senate. LePage and Republican legislators have said that the state’s $2.5 billion Medicaid program is already unsustainable and should not be expanded. Democrats have countered that the federal government will fully reimburse the state for the cost of expansion through 2016 before gradually reducing the funding to 90 percent, after 2020. They say that if Maine does not expand Medicaid, it will increase the likelihood that more than 150 low-income Mainers with chronic illnesses will die, based on statistical projections about the uninsured population. About 36,000 people would fall into a coverage gap because their earnings are below the poverty level so they don’t qualify for subsidized insurance on the federal marketplace established by the Affordable Care Act. The law assumed that anyone below 110 percent of the poverty level would be covered by expanded Medicaid programs in their states. It also mandated that all states expand Medicaid. The U.S. Supreme Court struck down that provision of the law in 2012, leaving it to states to decide whether to expand their Medicaid programs. The fight over expansion is expected to play into this year’s legislative and gubernatorial campaigns, as it has in the 21 other states that have not expanded Medicaid. LePage vetoed two expansion bills passed by the Democratic-controlled Legislature last year. One of the vetoes came just minutes after the Senate gave the bill final passage. LePage signed the veto message in front of a bank of television cameras and assembled media.